Mustang ll is also known as the second generation Mustang. These cars were manufactured from 1974 to 1978. Reports are that they were produced to help fight the tide of import cars and their better fuel efficiency. Although Japanese import cars were not particularly popular back in 1974, the arab oil embargo, rationing and skyrocketing gas prices started the move towards cars with better gas mileage. 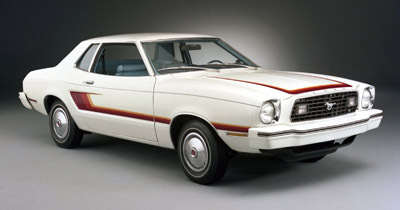 Due to emissions considerations and the decline of the previous heavy Mustangs from 1973, the new car was born. Along with the smaller size, it was said at the time to be more like the original and still very popular 1965 - 1970 vintage cars. Unfortunately, it's base 2.3 liter 4 cylinder engine, borrowed from the Ford Pinto, didn't help its muscle car image. No v8 was in store for Mustang ii fans either and although an optional 2.8 liter V6 was offered, the usual stable of pony car buyers had moved on to greener pastures. Sales reached to over 296,000 units, a drastic improvement over the 1972 and 1973 levels, but its reputation as a performance sporty car had not been revived. 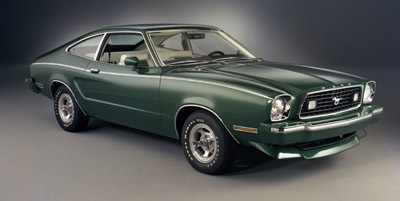 For more detailed information on the 1974 Mustang 11 click here. Ford engineers went to work to add those missing ingredients for the 1975 Mustang 2, including, shoehorning in, 5.0 Liter V8 into a too small engine compartment. To help the fit, only a 2 barrel carburetor was used. Compared to today's new Mustang with its 300 Hp + engine, the 1975 car could only produce a mere 130 hp. More detailed information can be found on the 1975 Mustang ll by clicking here. 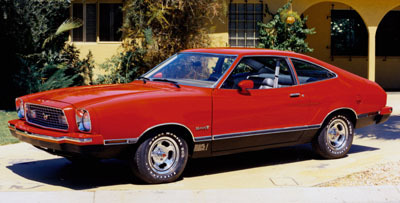 In 1976, Ford's changes to the little Mustang ii were evolutionary and the precursor to the revolutionary. Styling treatments, including a blacked out grille and other features made the car appear more aggressive. 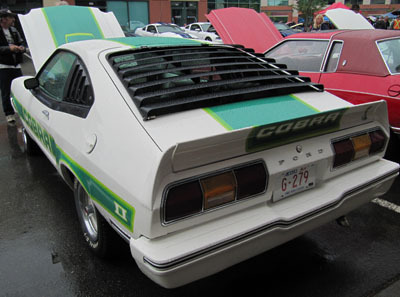 A new model was introduced, called the Cobra ll,which was of course named after Ford's 1968 Mustang Cobra. With its add on spoilers and non functioning hood scoop, the look was certainly much more serious and sports car enthusiasts started to take note. More detailed information on the 1976 Mustang here. For more detailed information on the 1977 Mustang click here. For more detailed information on the 1978 Mustang click here. One of the little known Mustang ll "tuner cars" was the 1978 Munroe Mustang Handler. A joint venture between Hot Rod Magazine, Munroe Shocks and some other big names, the Munroe Handler took front page on the June 1977 cover of HOT ROD Magazine. Here's a link to the full story. 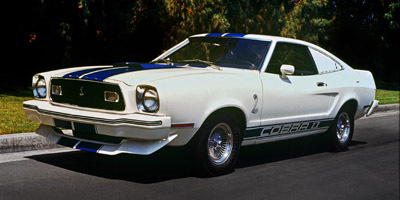 The year 1978 marked the addition of a limited edition Mustang ll, called the King Cobra. It featured the improvements on the body kit pieces and offered only the 5.0 Liter V8 as an engine choice. Although the Mustang ll motor wasn't particularly impressive in its stock form, performance part manufacturers and hot rodders knew how to fix that little problem! These days, most of the cars from that era are considerably more powerful than they had been when fresh from the factory. Its relatively easy to coax some pretty extreme performance from the 5.0 liter engines with aftermarket parts like headers, a more aggressive cam, high performance intake manifold, and maybe a 100 shot of nitrous ? 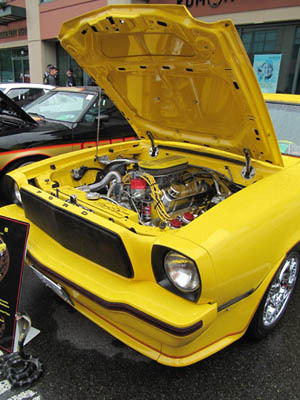 The latest PoCo (Port Coquitlam, BC Canada) Mustang show had a great turnout for the Mustang II. The stable included a number of Third Generation Mustangs, including this rare factory 4 cylinder Cobra. This is the place to send your third gen Ford Mustang pictures and information and show the world !